So far, not so good! 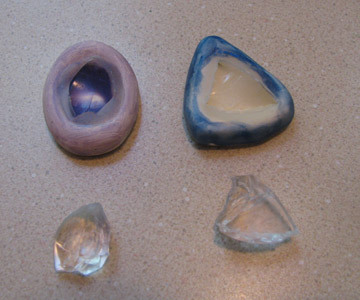 I've not yet found a satisfactory way to combine the new silicone product, Rubber Glass with polymer clay. Cindy Lietz has been emailing back and forth with me, and just when we thought we might have it figured out, "disaster" struck! You see, the problem is that silicone doesn't stick to anything. Not even to itself once it's cured. No common epoxies or adhesives will stick it to anything else. You think it's working while the glue is drying, but once it's totally dry, the silicone piece just pops right off. There is a special adhesive called Sil-poxy which will stick it to other stuff, supposedly, but it's not a firm enough bond to trust with items that you're going to wear. 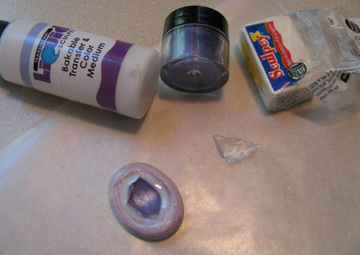 So, Cindy thought we should try to embed the silicone pieces in liquid polymer clay. I had some TLS, a Sculpey product on hand, so I gave it a whirl. I deliberately chose pieces that had larger bottoms than tops so that there would be some "overhang" to embed in the liquid clay. 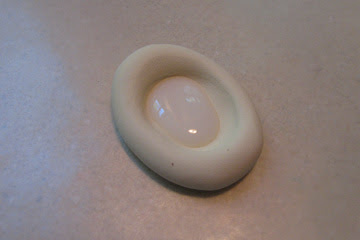 Silicone can take the heat, so I formed a reservoir in a small slab of clay and filled it with liquid clay. 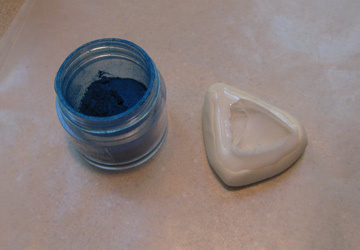 I tried it two different ways, adding pigment powders before and after adding the silicone piece. The silicone just popped right back out, even though the baked clay surrounded it! Back to the drawing board :-) Anyone else have any great ideas? Maybe just wire wrap the pieces. Then you can really see the transparency of the faux glass. Glad you are experimenting for us all though. The problem with wire wrapping is that it fractures pretty easily. I've already shared a tutorial where the wire was embedded *in* the silicone, and that worked well, but it would be hard to manipulate anything but very thin wire around the outside of the silicone without causing it to split. I hate to be a wet blanket, but I don't think there is a glue that will stick to silicone. My hubby has worked a lot with aquariums and pumps. He says not even silicone glue will bond to dry silicone. 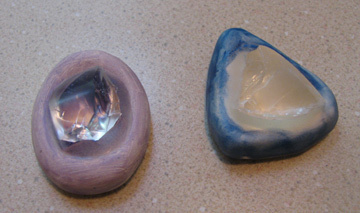 How about embedding metals prongs into the polymer clay before baking to hold the rubber glass? There is a new adhesive called Sil-Poxy which *does* bond silicone to other materials. But it's not a particularly strong bond and I'm afraid that the flexing that you'd get from a wearable piece would pop the bond.